Derelict is a short film directed by young writer/director Simeon Lumgair that was shot in London over 4 days in September 2010. Starring Israel Aduramo (a regular actor on British TV screens) and Graham Cole (best known as Tony Stamp in ITV’s The Bill), this 12-minute film is set in 2025 when the Water Wars of Europe have pushed civilisation “to the brink”. Prisoner of war Onesimus (Aduramo) is on the run but, when cornered, takes an old man (Cole) hostage. 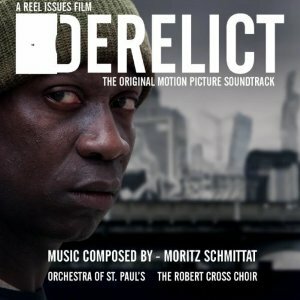 Film scoring newcomer Moritz Schmittat (31 North 62 East, De Ander) composes an adrenaline-fuelled score that relies heavily on string ostinatos supported by a strong brass section, enthusiastic wordless choir and a significant percussion presence, emphasising rhythm rather than the theme. Strings, brass and percussion all blend to provide a rhythm that propels the music onwards only taking a breather occasionally, for example in the second track, “Immigrant Parasite”, where ethereal vocals waft by before the rhythm regains the initiative. It is with the final few seconds of the penultimate “Going Underground” (that features a beautiful solo vocal) and the final track, “Someone Has To Pay”, that the score slows in pace for – I presume – the final emotional scene. Orchestra and choir join forces to provide an emotional climax. Lumgair must have had a very tight budget for this short film but uses a chamber orchestra (London’s Orchestra of St. Paul’s) and The Robert Cross Choir to give the film a powerful, organic score that would be at home in any Hollywood blockbuster. With a score for a 12-minute film Schmittat can’t hang about with the music but immediately establishes a tone with the solid orchestrations for the music. Schmittat’s resumé is filled with compositions for short films and is familiar with what is required for such short productions. Derelict is a great little score if you like your music raw, percussive but shaded with an emotional aspect. The score is available as a digital download at most of the usual outlets. A video of the scoring session for the score can be viewed at Vimeo and the soundtrack can be heard in its entirety at Soundcloud. For more information on the film itself head over to the film’s website. Audio samples can be found HERE and then click on arrow next to running time for samples of entire album or individual tracks. Moritz Schmittat has produced a remarkable soundtrack. It is an outstanding piece of music, and works perfectly with the film. It is well worth hearing this terrific soundtrack.